UCF used two big scoring runs on Saturday to beat UConn 49-24. The Knights (9-0, 6-0 AAC) are now ranked No. 15 in the College Football Playoff. They hit the road next weekend to face off with Temple, but before looking ahead, what else went down around the AAC in week 11? There were no surprises in the AAC this week and it wouldn’t be a shock if the same is said for week 12. UCF heads to Temple on Saturday and will get a streaking Owls team that is now playing for bowl eligibility. 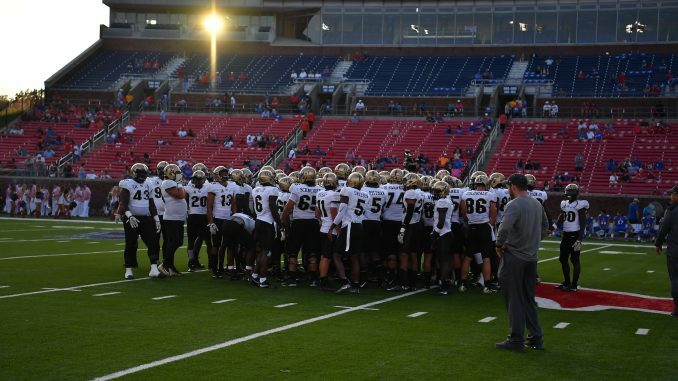 Regardless of next week’s outcome, though, the AAC East will be decided on Black Friday when the Knights host USF. The two teams have been on a collision course throughout the whole season and both have just one more test before the rivalry showdown. As for the rest of the division, Temple is most likely the only team with any chance at making a bowl game. In the AAC West, most teams were idle this week. But with SMU’s lost to Navy, next weekend’s matchup between the Mustangs and Memphis carries less weight. At this point, the only way the Tigers don’t win the division is if they lose out. Even then, other teams would have to win out to give themselves a chance. With just two more weeks in the regular season, the likely matchup for the AAC Championship Game on Dec. 2 is Memphis against the winner of the War on I-4.